What is the best way to remove the bushing from the driveshaft tube? I have looked around the shop for something, but have not found anything yet. I tried a 1” steel water pipe, but it did not appear to fit. I am thinking about ripping down a 2x4, but I am not convinced it will work. 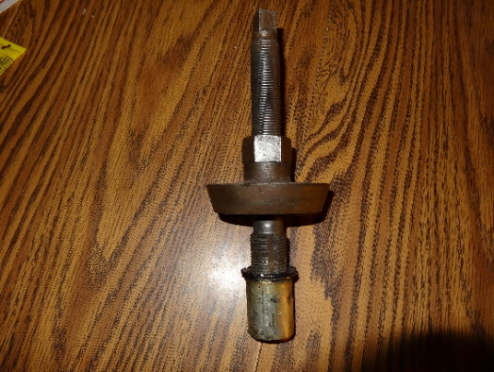 The drive shaft at the bushing measures 0.9521 to 0.9675, and the bushing appears to be extremely worn. I tried a piece of rebar but I just could not get a “bite” on the edge of the bushing. When I slide the rebar up to the bushing is slips past, and I can barely feel the edge of the bushing. Got sockets? Put in one that will sit against the bushing but is small enough to miss the rivets, then drive it down with an old drive shaft or a piece of 3/4" pipe. i used a gear puller, heat and patience. mostly a gear puller. if you have one of those... your set! Old trick is to use the driveshaft to drive the bushing out. This tool will do the job. I used epoxy to glue four washers together then ground them down every 90 degrees to make a "puller" that resembles the Snyder tool. The gaps are to let the washers miss the rivet heads. Used 1/2 " all thread with nuts and a piece of plywood to pull the bushing. Don't remember whether I had to grind off the rim of the washers as well. I'm with Erik - a 2x4 on the ground so I didn't mess up the concrete or the driveshaft, I just gently bumped the whole assembly down a couple times and the bushing came right out. I didn't remember what size (but Mr. Chaffin's 15/16 sounds right) I found a socket that matched the diameter of my new bushing, dropped it down the tube, and then put the driveshaft in behind it. Also, when I say a couple bumps, I mean I picked it up maybe 2" and dropped it. Ditto what Seth said except for me the 2" was 2 ft. and the couple times was 4 or 5 times! I will try Chaffins method with a 15/16 socket and the driveshaft. I did think about using the driveshaft, but really did not like the idea of potentially damaging the threads. I do not have any gearpullers or other items suggested tools, and I am too cheap to buy a tool that I may never use again. Last night I tried a 1” water pipe, it fit down but hung up on the rivets. I spend a fair amount of time looking for my two, five foot ¾” black pipe, but never did find them. A piece of 3/4" pipe will work just fine by itself. Hey Jason, just put the pinion gear nut on flush with the end of the driveshaft, and when you "hit" it, make sure there's a block of wood between the floor and the driveshaft. It won't jack the threads up that way. Lol Bud, mine just came out easy as pie. When I was reading about all this heat and pullers I realized maybe I was really lucky and didn't even know it. It sounds like it was a lot more of a chore for some folks. More like what I went through trying to get the bearing sleeve off the other end of the driveshaft. Good heavens. I was rebuilding the rear end and going to use Mr. Regan's Pinion Bearing Kit. I didn't think I'd ever get that blasted sleeve off. I beat on it, heated it, eventually the only thing that made ANY progress was to set the vise tight enough to slide the driveshaft through but catch the sleeve - I would lift it as high as I dared and pull down and slam that thing 5 or 6 times, and it moved less than a quarter inch. It was grueling, exhausting work getting that thing off. LOL my mom came out to the shop and said "WHAT are you doing? I can hear you anywhere in the house and sometimes it's making the windows shake." This has worked best for me for years. I have a 1 1/8 inch tap. Thread it into the bushing. Take an old steering shaft and with the drive shaft held in the vise, put the end of the shaft in the bottom end of the tube and give it a mighty toss. A couple good smacks and the bushing will pop out. Takes probably two or three minutes from beginning to end. I don't like pulling the bushing from the front. Years ago I ruined a nice bell trying to pull a bushing with a cobbled together puller. Some of them are pretty tight. Especially a lot of the bronze bushings that have been installed over the years were pounded in with a big hammer, they are hard to pull. I've used and old TT drive shaft and gotten away with it. I think the square end was mushroomed a bit (we used it to anchor the silo filler and the buzz saw on a regular basis) so it clears the rivets but won't pass through the bushing. Well, no luck this evening! I did not have a 15/16 socket, but my 7/8” impact socket I figured as fairly close in size and it fit past the rivets. It took a lot of pounding but all that was accomplished was reaming the bushing. So I found the largest impact socket (21mm or 22mm??) that would fit past the rivets. All I did again was ream the bushing. It looked like the bushing might be cracked, but I am not sure. I thought about my air hammer, with a chisel and try to cut it? But it looks as if there is a lip and I do not want to damage it. Was also thinking about using a saw blade (hacksaw or long reciprocating saw blade. If you make a washer like this, with or without a hole you can pull or drive it out. 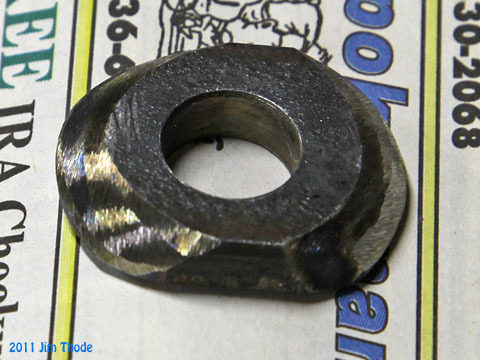 The washer is shaped to fit around the rivet head and nearly the full OD of the bushing. More photos in the link above. I thought mine was tough! Another thought, use one of your sockets and a long piece of pipe (3/4"). Use you air hammer with a blunt tool attached to hammer on the pipe. Sometimes a little vibration will work where nothing else will. Weakening that bushing with a saw cut will help ... I don't have to mention to be careful how far you cut! Good luck - you WILL get it! What is the OD of the bushing? The OD is close to 1-5/16". I measured 1.312" on the one I took out. Jason, sounds like yours is the original babbit type. Get a propane torch and play it directly on the bushing. Should be able to melt it out. Expect some smoke from old grease. Here is what I use, works great every time. I got it out this morning. I had to use a hacksaw blade and cut through most of the babbet bushing in two places 180 deg from each other. Then I used my 21 mm impact socket and the drive shaft to pound it out. Even then it took a lot of pounding. When I measured my 21 mm socket it measured 1.269X”.